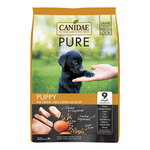 Buy Canidae dog food online at Pet Circle and enjoy the convenience of delivery straight to your door, always at the best price. 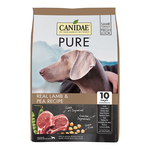 All natural, holistic and wholesome, Canidae dog food is free from artificial colours and flavours, hormones, antibiotics and wheat - meaning that it has nothing to hide. 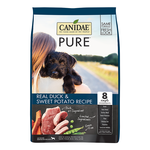 In fact, Canidae's ingredients are considered human-grade! 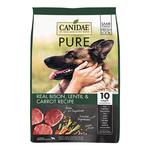 For dogs with sensitives or allergies, limited and grain-free diets can make a world of difference, because there's nothing in their food to set off these sensitivities. 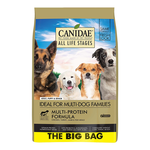 Aside from this, Canidae makes high-quality kibble for all life stages, as well as specialty formulas for puppies and senior dogs, meaning that Canidae dog food can accompany your pooch throughout their life, for a healthy, wholesome life. 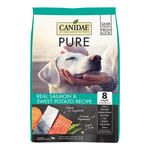 Select a product from above to view ingredients and Canidae feeding guidelines, and choose a delicious flavour for your dog's new food including salmon, duck, lamb and bison.